A Bristol man has been fined £250 after admitting fly tipping household waste in Yate, South Gloucestershire. Roberto Cuenca, 31, of Coldharbour Road, Redland, Bristol, appeared before Northavon Magistrates’ Court on Friday 3 July. He pleaded guilty to fly tipping, not having a waste carrier’s licence, and no waste transfer note, and was fined £250 with £500 costs, plus a victim surcharge of £74. The fly tip took place on 21 February at land off Farm Lane in Yate belonging to Says Court Farm, Iron Acton. The court heard how a resident of Chapel Road in Yate needed to dispose of some excess household waste. Despite living near the local Sort It centre, some of their waste was too large to fit in their vehicle and after searching the internet they came across a company called ‘The man with a van Bristol’. On Saturday 21 February the Yate resident called the mobile phone number advertised and spoke with a man called Roberto Cuenca. He agreed to visit their house later that day and remove their waste for a price of £20. He arrived early that evening, loaded their waste into his van, and gave the residents his business card before leaving. 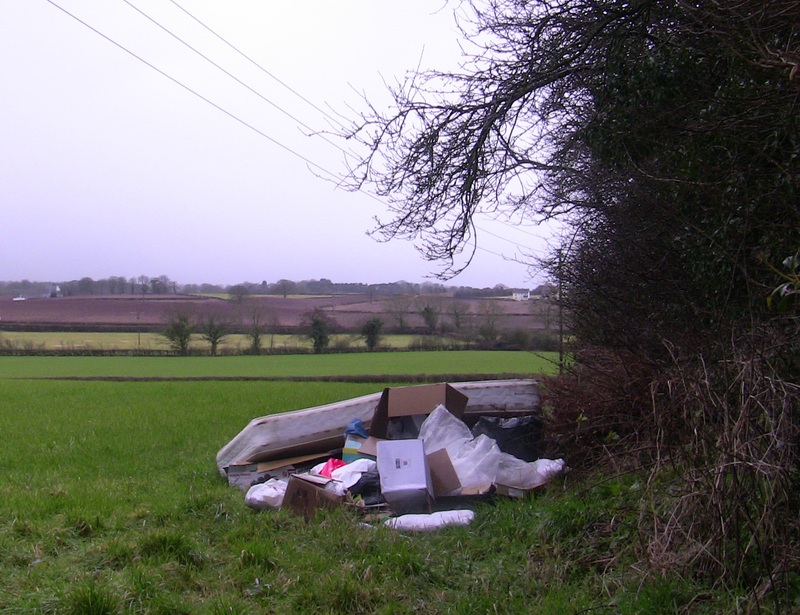 Early the next morning (Sunday 22 February) one of Says Court Farm’s owners discovered a large fly tip in a field near to Badminton Road. Documentation relating to the Yate resident was discovered amongst the waste and the landowner contacted South Gloucestershire Council’s Environmental Protection team. Council officers visited the site and took a series of photographs of the fly tip as well as seizing the documentation found at the scene. Officers then visited the Yate resident who identified the waste in the photograph as that taken away by Cuenca. On Friday 13 March Cuenca voluntarily attended the council’s offices where he was interviewed under caution. Cuenca declined legal advice and admitted that he did not have a registered waste carriers licence. During interview Cuenca accepted that the fly tipped waste at Farm Lane was the waste he had been paid £20 to remove. South Gloucestershire Council’s Communities Committee Chair Cllr Heather Goddard said: “This latest prosecution serves as another reminder that if you are involved in the illegal dumping of waste in South Gloucestershire, you will be prosecuted. Residents are advised to only give their rubbish to an Environment Agency registered waste carrier or they could be held liable if waste is subsequently fly tipped. • Ask for a copy of the company’s waste carrier registration certificate and ask where the waste is being taken. Legitimate firms will be happy to provide this information. Do not be tempted to use people offering cheap waste clearance on sites such as Facebook and Gumtree unless you have confirmed that they are registered.